I have a question about the angle of the rudder hinge line and roll coupling. I believe if the angle is 90 degrees, it will not induce roll.If the angle is like a Cessna 172, wouldn’t this induce some roll when deflected? I think the angle affects pitch coupling more than anything else with a swept back rudder creating an upward pitching response. That's desirable in a Cessna, as it reduces the plane's tendency to pitch down with a rudder only turn. Roll coupling with rudder depends on several factors including wing dihedral and the rudder's location relative to the fuselage centerline. A high mounted rudder will produce an opposite roll response unless the wing has some dihedral to counteract it. yes. the nose up attitude from the swept rudder hinge line puts the outside wing tip ahead actually making the wing's dihedral on that side, act as if it has an increased angle of attack which lifts the outside wing, banking the airplane. the reason it is thought that a plane with decent dihedral doesn't really need ailerons.. The rudder hinge line angle to the fuselage datum has little, if any, bearing on yaw/roll couple. The swept hinge line referred to was supposed to help keep the nose of the airplane from dropping during rudder induce turns, but has little real effect. The greater the sweep, the less effective the rudder actually is. As stated, the effectiveness of the yaw/roll couple is all down to design. High wings, dihedral, and the disposition of the rudder area above and below the roll centre all contribute to how strong the roll couple is. In its simplest form, high wings with dihedral respond well to the yaw/roll couple, low wing models with no dihedral do not. Well stated, but I'd make one clarification. Low wing planes without dihedral have yaw/roll coupling in the opposite direction. For instance, apply right rudder and the plane will roll left. That's the problem with the TF Contender, for example, and why they offer up turned tips as an option. "disposition of the rudder",.....hhhmmmm,....so the disposition of a rudder that is deflecting air to the right and at the same time letting that deflected air vector up will not push the tail down and raise the nose around the CG ?. I dunno ,...if you ask me that defies physics in every sense of the definition of "defy". I've studied, built and sailed on 1/4 million dollar sailboats and the same principles of rudder deflection apply to both,...and..... it is known that the inclination of the rudder hinge line of a sail boat will influence the height of a sailboat's bow during a jibe, or on a tack, for that matter,.....it is what the rudder hinge line is inclined (or swept) for,....it gets the bow up to reduce wetted surface and allows the boat to to be redirected easier because there is less hull in the water now water is of course much more resistant and therefore it's effect is more clearly seen, but the laws of physics don't change because of the medium being affected. Last edited by BMatthews; 04-30-2018 at 11:14 AM. That's very interesting, but a boat does not have a horizontal stab. When an airplane banks, the nose drops because the force vector of the wing is no longer straight up, and any slight effect the angled rudder might have in holding up the nose is practically impossible for a pilot to notice on the ground. The way to hold the nose up in a turn is to use up elevator. My experience with model airplanes is the same as what Evan stated, angling the rudder back has little effect on pitch. I used to fly one of those old rudder only types with the rudder angled back. The nose still dropped. Did it drop a little less because of the angled rudder hinge? Maybe, but I don't know how you'd detect it. you might want to have a look look at the keels and rudders of current and recent AC boats......very much like a t-tail but inverted, complete with small ailerons and trim tabs. water and air behave much the same dynamically and the boats share a lot of the same science with aeronautics, both above and below the waterline in terminology and in function.....( a sail isn't just a big sheet that catches the wind). keels have (airfoil), "Hydrofoil", in nautical terminology, for the very same reasons wings have airfoil.....to develop "lift".... and it is called "lift" in hydro-design terminology as well and does exactly the same thing as a wing's lift,....exactly the same. it really doesn't matter if the "pilot" notices it or not,.....that wasn't the subject matter, here that small amount of lift is there and serves a purpose,....the rudder hinge lines aren't swept back just because they look streamlined. I am not that interested in boats and I did not comment on boats at all. Airplanes are not buoyant in air, they generate lift with the wings and the stab/elevator determines the angle of attack of the wing. Putting an angled hinge line on the rudder acting at the same point as the horizontal stab doesn't strike me having much likely effect, and my experience in practice is that it does not. The fact that keels, tabs, penguin wings, etc. act in water in ways that are analogous to wings does not change this fact. I'm done with this. First off sorry that it looks like I edited your post which is quoted above. I hit the button that only I can see as a moderator and ended up adding the text below to your post. In removing my comment it shows as my having edited your post. I don't think I changed any of your original content. If I did I apologize. Back on topic...... Technically you are 110% right. There is some coupling. But on our airplanes the slight pitch up from an angle rudder hinge line is very small in relation to the tendency for the model's nose to drop into a spiral dive when in a turn. So while the intention of the swept back hinge line was to aid in reducing the nose dive in reality there's little or no noticeable effect. So much so that if one were to fly identical models other than a vertical vs 30° swept back hinge line it's doubtful if they would notice any difference in handling in the amount and timing of the coordination of the elevator to make the turns. where is the line drawn between the tendency to drop the nose and the rudder hinge line angle preventing this (or at least most of it) nose drop from happening. what is the difference between eliminating typical nose drop and actually producing nose-up attitude, to my mind, no difference...same-same..... it is the same force vectors that produce both results. I guess the point I am trying to make is that if the hinge line is swept, there is nose lift in effect, regardless of whether it is noticeable or not. you cannot generate and establish a physical reaction and then claim it has little to no effect on something because you can't notice it. physics is physics. you can't produce two opposing forces that cancel each other and say neither one has any effect, they both have an effect and the balance between the two is equal. if this weren't the case, there would be no reason to sweep the hinge line. Skyhawk, just out of curiosity, is there a specific application that you have in mind? I had a scratch-built (by my Father) sport type airplane with a fairly drastically swept hinge line on the vertical fin and it definitely had some effect on the pitch of the model. Took me a few flights to figure out why in the world the airplane wanted to pitch up on take-off but otherwise was perfectly trimmed. It was, of course, because I was holding a substantial amount of right rudder during the take off roll. The airplane was a .40 size tail dragger, mid-wing, with a semi-symmetrical section in case that information interests anyone. Never did take pictures of it unfortunately. Built a Kaos 90 pattern plane from plans last year. My first classic pattern plane, and wow, flies like it's on rails. It has no roll coupling on the rudder input. Most honest flying plane I've had. Point it and it will go till you re-point it. Building a OV-10 electric now, almost done. I did agree that there IS some coupling. So I'm not sure why you're replying as though I posted something that directly suggested that there is no such coupling of forces. I stand by my findings though. I've never flown a model with a swept hinge line that showed any tendency to actually nose upward when the rudder was applied. And in fact even the swept hinge line models did not show signs of needing less elevator to keep a turn level. And while flying such models, be they powered or glider, I never noticed that suddenly using lots of rudder caused any need to moderate the elevator to hold the nose level during a turn. Thus my statement that you or anyone else would be hard pressed to notice such a mix of effects. It's certainly there. But it's simply not significant when compared to the other factors that on a rudder only turn is working to drop the nose and make the turn into a spiral dive unless some elevator is used. I wasn't try to e argumentive, I guess I was just say as you do,...."it is there". and that we maybe don't notice it because the normal tendency to drop the nose is counter-acted by the function of nose-up from the swept hinge line to the point that the fuse maintains attitude. still,...it is there,...it's just being used to balance an opposite natural function. Ah, sorry then. I misunderstood the tone of your post. Reviewing this thread I do recall way back when pulse rudder was popular and Galloping Ghost was a close cousin I read a write up where someone set up a "rudder only" model with an extreme angled hinge line. The idea was to use the pulsing to produce some up and down control in the same way as Galloping Ghost did but without the mechanical mixing. The outcome was that while there was SOME elevator ability with the change in pulse width that it was only just enough to deal with relatively shallow turns. And consider too that with pulse setups the controls move pretty much to full travel a number of times per second. And even that wasn't enough to create a strong enough effect just from the rudder movement with the swept angle. So for whatever reason while it's there it's a rather weak effect compared to the yaw that the rudder can produce. I wonder if it's because from the pitch standpoint the "surface" area trying to lift the nose has a very short aspect ratio? It's not like the rudder is a strongly spanwise component like a V tail would be. All in all I would have to say that the "Stereophile Rule" applies to the rudder hinge line/roll coupling question. Some people can tell the difference between $250 speakers and $500 speakers. I can't, so for me it is a waste to spend that extra $250. A world class aerobatic pilot might notice the difference in rudder hing line, all other things being equal, and he might be able to demonstrate it in a way that an average pilot could see what he is talking about. While it is undoubtedly there, the impact of rudder hinge line sweep will probably be masked by all of the other aerodynamic forces on the airplane and will be negligible for 99% of all pilots/airplanes. Now that this has been said I'm sure that someone will come up with the one example that proofs the rule. rudder size would most likely have some input. bigger (deeper) rudder would have a bit more input. consider the time a rudder spends at full deflection with pulse compared to modern proportional. main vector is in yaw because of profile orientation as compared to pitch vector. if rudder deflected to 90 deg. or so , it might be different .....the closer to 90 deg. the more pitch input. at typical rudder deflection angles most of the pitch producing air is simply slipping off the top of the rudder. that's why it's considered "unnoticeable", but yet,....it is still there and in the case of the afore mentioned Cessna, they are using what is being produced to eliminate the need (or some of it) of a little up stick in a turn. think,...."if you can drive a car...you an fly a plane"......(they did use that campaign way back when). One place where the up elevator coupling from a swept hinge line would show up would be during a wingover where a lot of rudder is being used. If it were a strong effect it would try to loop the the model over onto it's back at the same time it is producing the yaw needed for the wing over. As you say though often we don't use a whole lot of rudder angle. And it seems to me that if one did a top down view of the "elevator" exposure area of the rudder as it is deflected there would only be a decent amount of area when at larger angles of deflection. At moderate angles not so much. So it's not like the up elevator effect from the rudder's hinge angle is directly related to the angle itself equally across the range of movement. 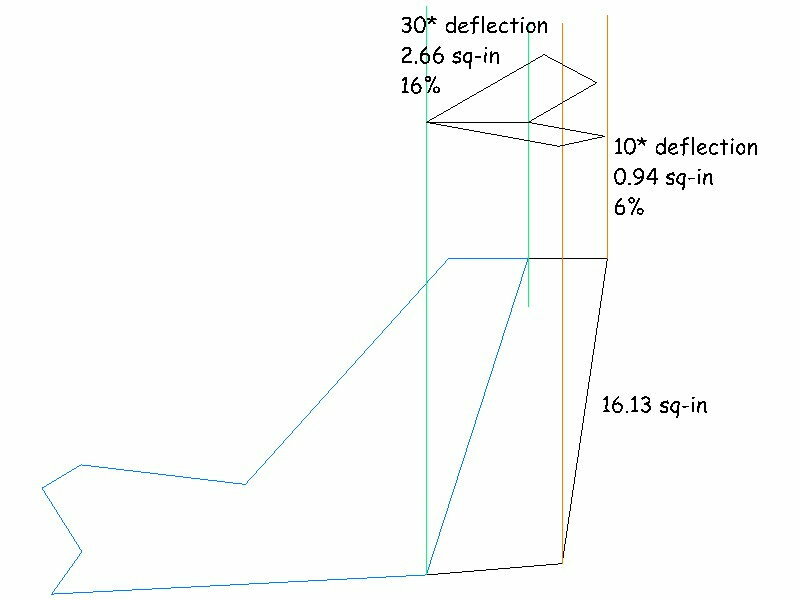 I'm sure there's a mathematical way to describe this but for me it's easier to do it in CAD...So 10° only "sees" an elevator exposure of 6% area while 30° "sees" more like 16% of the rudder area. So it's a sliding scale based on the angle of deflection. And really other than model gliders not many models use much over 15 to 20° of rudder deflection. To me this pretty much explains why I have not seen a noticeable effect from a swept rudder hinge line in my model flying. It's certainly there, but it's such a small effect for reasonable hinge line angles that it's overshadowed by other factors at any sort of normal hinge line angle. I also suspect that because of the way the air flows around the rudder that there's some reluctance to deflect upwards when it's easier to slide sideways around the rudder. So my guess is that while the angle will lift the air slightly that it won't match the percentages. Especially at the lower deflection angles. If we laid the hinge line down at more like a 45 or greater angle and fly rudder elevator style models which require more rudder deflection then I could see the pitching couple becoming significant and noticeable in flight. But it only shifts the point of needing to apply elevator in a turn to that portion where a higher angle of rudder is needed. Once into the turn and holding just a sniff of rudder angle to maintain the turn size we'd still need to use the usual amount of elevator. it works as exponential function of air speed,....the higher the speed the greater the lift for any given rudder size. air deflects sideways and compresses against itself so it looks for another route to take. that route is up off the top edge of the rudder in a swept rudder hinge line. air slipping off the top of the rudder compresses and forces the taildown,,eg ...nose up. the exact same thing happens with a swept rudder hinge line in a sailboat and it is done for the exact same reason,...to get the nose up,.... and in the case of a sailboat,...reduce wetted surface forward during a jybe or comming about. it just so happens that water is much more stubborn than air so the effect is much easier to see and accomplish. but the functional principles are exactly the same. the earlier mention of a boat's buoyancy has absolutely nothing to do with the principles we are talking about. the effects of hydrofoil function has no connection to a boat's buoyancy, the boat would have the exact same buoyancy with or without the hydrofoils and the reason a boat "flies" on it's hydrofoils is because those hydrofoils over come the boat's buoyancy and that eliminates it from the picture. there has been plenty of research about just how the water flows around a boats appendages,....it is essentially the basis for AC boat development. as the flow contacts the swept rudder's surface it is deflected both out away from the keel fin and (because of the swept rudder surface) slightly upward. the latest trend sees small horizontal stabilizers on the bottom of the rudders to keep the flow from slipping off the end of the rudder, there by amplifying the lift it generates these small hor. stabs have little trim tabs that are adjustable on the fly and are used to trim attitude as the boat heals on a beat. these trim tabs can be compared tote small amount of elevator input to trim the plane in level flight, as "level flight" in a sail boat is about 30 degrees of heal there is allot of overlap and similarity in the foil dynamics between boats and planes if you know what to look for. I've seen that effect on sailboats. But it's just not as big a deal on our airplanes. There's no doubt that the effect is present. But on model airplanes it simply is too small compared to other things to cause the pilot to have to adjust how they fly. I've flown a bunch of models over the years that had anywhere from straight up and down to around 30 degree sweep on the hinge line. I never felt like the swept hinge line models had a secret elevator hooked to the rudder that confused things when I few such models. I recall during my windsurfing days that if I hung off the harness to the boom and canted the board to leeward that I could get lift off the dagger board and rise up and run on the dagger board and just a little of the lee rail of the board. Great fun but needed a delicate touch or the lift from the dagger board would flip the whole works over and me along with it. But it was pretty close to feeling what a hydrofoil is like. At least as close as I ever got. It didn't take all that much angle to allow the dagger board to lift like that. And with my sail angled to windward it created its own lift. But it was quite an angle. Used to get some hang time off wave lips by tilting the sail too. Clearly you are pretty deep into the designing aspects of sailboats. And yeah, there are many parallels. But water is a lot harder than air and this angled rudder is just not as demonstrable for our airplanes as it is for your boats. you are right on all accounts. I was simply trying to iterate that the effect is there and there for a reason beyond looks,..... whether it be dismissed as unnoticeable or not, I doubt some aeronautical engineer simply decided that swept hinge line looks neater "so for now on i'm going to draw all my planes with a swept rudder hinge line". . I don't think there is an aviation engineer or naval architect alive who doesn't acknowledge the parallels between the foil physics of water and air. just because it is not a concern to people flying the plane, doesn't mean it isn't worth discussing it's attributes. it just seems that as soon as someone enters some factual contribution, everyone wants to dismiss the subject. I fly, too and have no planes that are or were designed by someone else,..... knowing both at the design level allows me to enjoy both that much more. Don't discount the role of appearance in modern design. Check out the models of the Cessna 150. When the fin/rudder shape was changed sales took off. But an old story I read many years ago had a reference in it to a slight performance penalty associated with the change to the swept tail. But it looked more racy and the change caused a big upturn in sales. The story is one that I read many years ago so it may in fact not be the 150 but some other design. But the point is that there was a performance decrease from the change but it was kept anyway because it was a popular look. When something needs to sell design choices are bound to lean towards compromises in any number of areas for the sake of appearance and provided the costs are not too high. I design a lot of the models that I build and fly as well. And it sure is a personally gratifying process. I've gotten away from it in recent years because I've enjoyed building and flying old timer free flight designs for their character. But now and then I still like to put pencil to paper or CAD up something different. Got to get a few old projects completed then I want to have a go at a few flying wing electric powered gliders.